Monuments are part of our heritage. They are created to commemorate a significant person or an important event that is historically relevant to the citizens of a certain place or even a whole country. The legacy left behind by these people and events helped shape our country's history and cultural heritage and it is just proper to give them the honor and recognition they deserve. 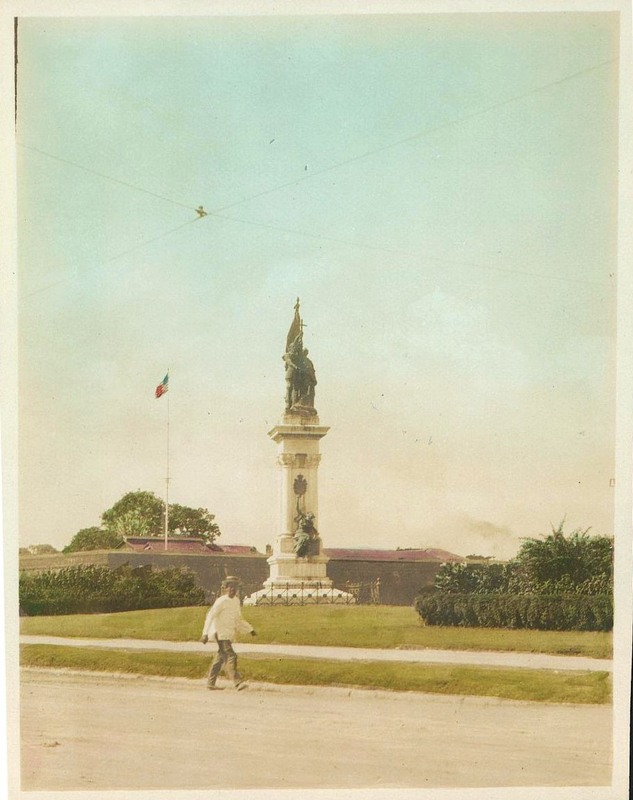 Legazpi-Urdaneta Monument viewed from the Manila Hotel, c1920s. 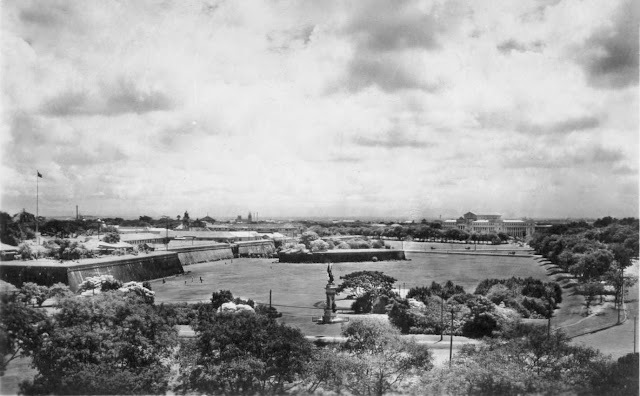 You can see the walls of Intramuros on the left and the newly constructed Legislative Building in the background. The spires of the San Sebastian Church can also be seen at a distance. There is one monument just outside the walls of Intramuros that I find particularly beautiful and elegant among all the other monuments around the Metro. I was not hugely familiar with this monument at first but totally not unaware of its existence either. Well, I knew it existed but I never really knew what the monument was all about. I never really got the chance to appreciate it completely until recently. The Legazpi-Urdaneta Monument is a historical monument located along Bonifacio Drive cor. Padre Burgos St., fronting the Manila Hotel in Manila. It is a few meters away from Luneta Park and a stone's throw away from Intramuros. 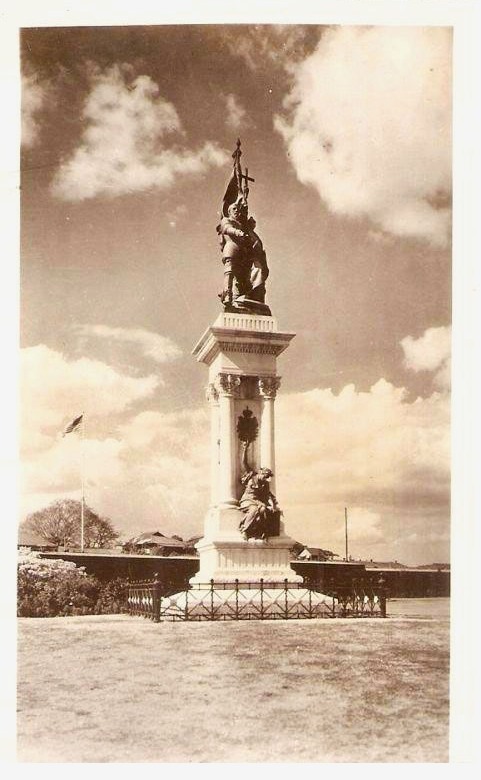 It commemorates the expedition and landing in the Philippines of Spanish cousins, conquistador Miguel López de Legazpi (First governor-general of the Philippines and founder of Manila) and Augustinian friar and explorer Andrés de Urdaneta, in 1565. 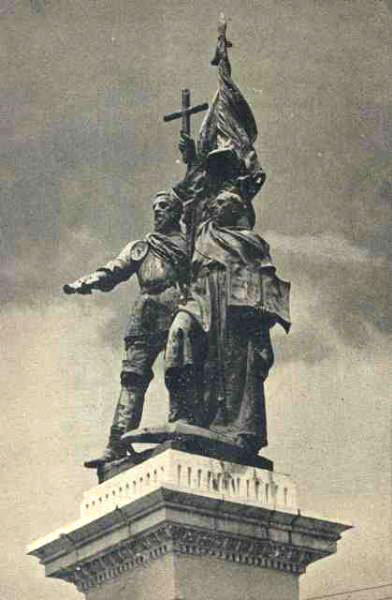 It marked the beginning of Spanish colonization and the introduction of Roman Catholicism in the islands. A close-up of Legazpi and Urdaneta. 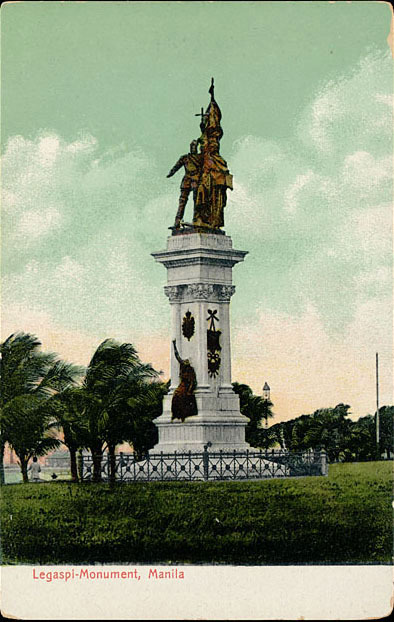 The monument depicts Legazpi holding a flag on his left hand and a scroll on his slightly extended right hand. Some accounts say that it is actually a sword (not a scroll) and the sword has been lost, or possibly, looted. After looking at old pictures and close-ups, it definitely looks like he's holding a document in the form of a scroll and not a sword. On the other hand (quite literally), Urdaneta is holding a cross which extends upwards to the sky and what seems to be a book (Bible?) on the other hand. Urdaneta is also stepping on an anchor. The anchor represents the expedition and it shows how the technical direction was controlled by Urdaneta. There is also a woman (Symbolizing motherland, perhaps?) resting on the bottom near the base of the monument. She is holding a block, inscribed on it, "XXIV Junio MDCXXI" or June 24, 1621. I got curious about that date so I researched but I did not get any direct information about it. The only thing I came up with was that this date was the 50th anniversary of the establishment of the city of Manila (Manila was established on June 24, 1571). The monument has a lot of symbolism and it is quite a powerful spectacle if you ask me. 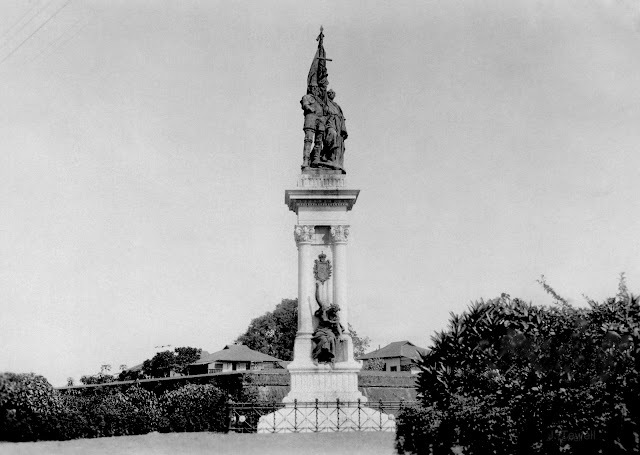 The Legazpi-Urdaneta Monument was commissioned by the Spanish Colonial Government in the late 1890s. Renowned Spanish sculptor, Agustin Querol, designed the monument in Barcelona, Spain. 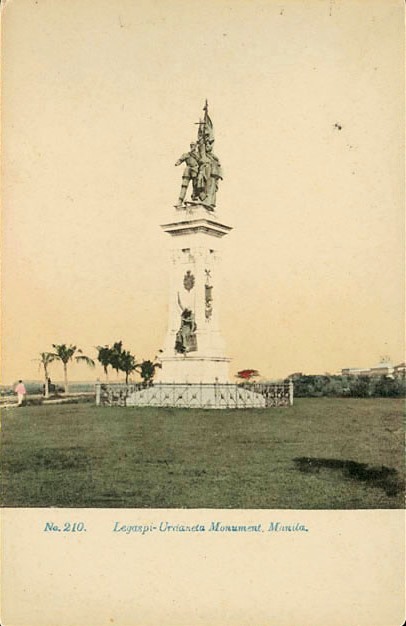 The bronze statue of Legazpi and Urdaneta rests on a marble-granite classical plinth and is decorated by other ornaments. By the time of its completion, the Philippines was already under American Rule but it was still shipped to Manila and was stored for years in the customs storeroom. It was finally erected in 1929. It has remained in its original location ever since. It miraculously survived, unscathed, during World War 2. The Legazpi-Urdaneta Monument amidst the ruins, 1945. Sadly, I believe that this monument is very underrated and it does not get the recognition it truly deserves. A lot of people are not aware that a monument so beautiful exists in our country. Unfortunately, this is the truth. Another colored postcard, 1920s to 1930s. My friend Paulo Bustamante and I recently visited this monument. It was actually my first time to see the monument in person. I fell in love with it and was completely hypnotized by its allure. Paulo was so shocked as we were approaching the monument and I did not get why he was so worried. When we were at the monument's base, I was completely outraged! 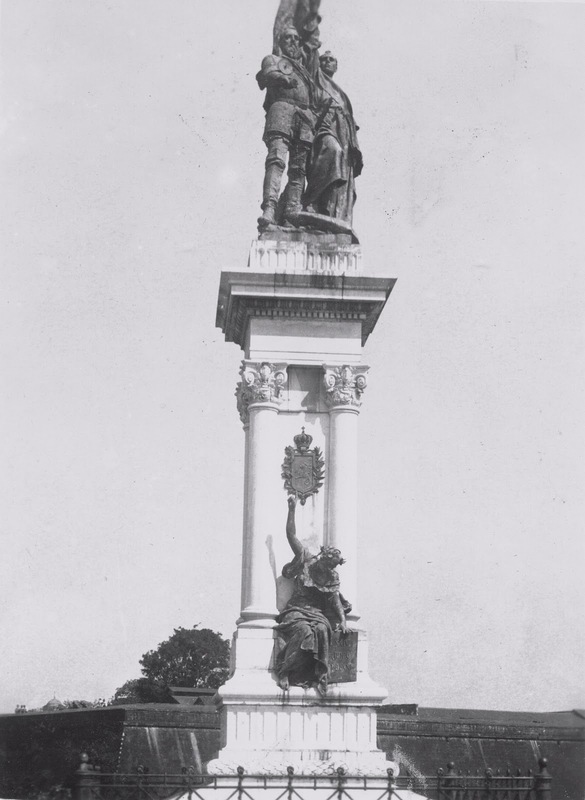 Some parts of the monument, especially the ones that can be easily reached by hand were missing. The plaques, and some of the minor embellishments were looted. I was so heartbroken that something so historical can be vandalized and disrespected just like that. Paulo took pictures and we were determined to report the crime to the Heritage Conservation Society. He posted photos for proof and everyone became so upset and the photos went viral in an instant. It felt really great because at least we know that a lot of people actually DO care. I just hope that in the near future, the stolen parts of the monument would be returned, if not, replaced. 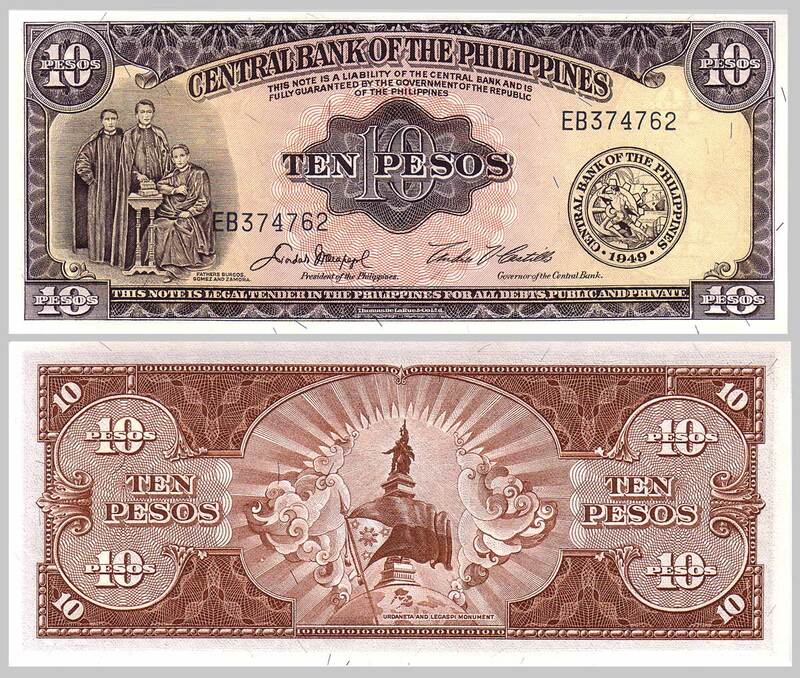 Back of an old P10 bill featuring the Legazpi-Urdaneta Monument, released in 1949. I also have an issue with the placement of the statues of Cory, Ninoy and Cardinal Sin near the vicinity of the monument. I am sorry, but I don't think that these monuments belong there. 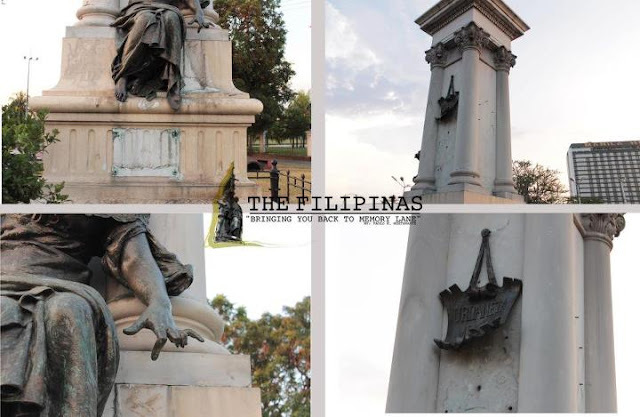 While I have the utmost respect for these people and their contributions to the Filipino people, I think that their monuments are out of place. 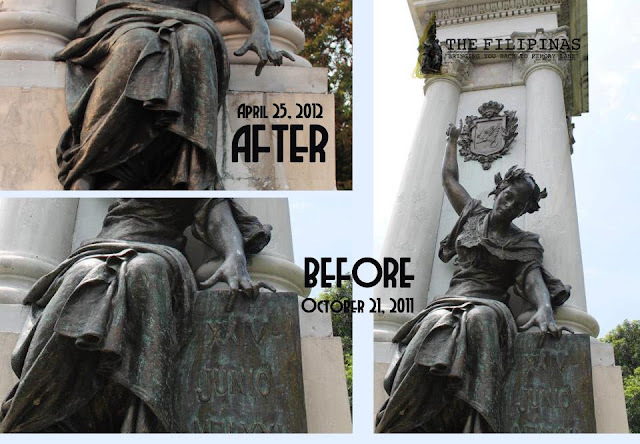 It completely envelopes the view of the Legazpi-Urdaneta Monument making it more unnoticed, further emphasizing the lack of attention it gets from local officials. one of the symbolisms of this monument is how it is positioned. 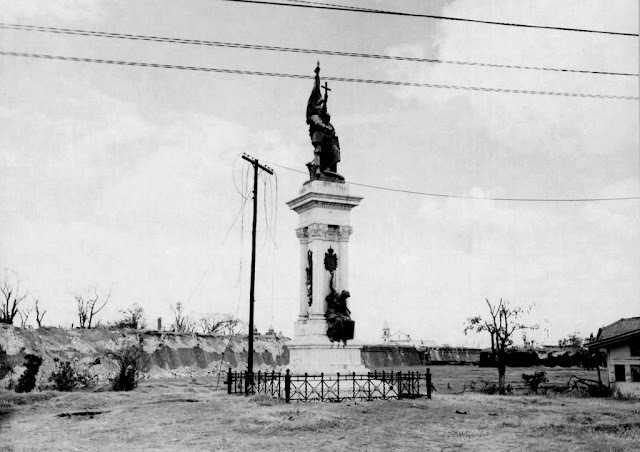 one part of the monument faces Kavite and another part faces Manila. there must be a meaning to this positioning. all the elements of this monument is replete with symbolism. Thank you for creating a blog and posting articles like this. This a big help for history aficionados and teachers like me. Enjoyed reading the nice posts in your blog. More power. you should start a petition to remove or relocate the aquino monuments.its 2017. i think duterte supporters will support.